Instructor Steve Jones, who leads the classes at Central Tai Chi, has studied Tai Chi for 25 years, under 2 Masters and 1 Grandmaster. Steve believes that Tai Chi should be accessible to all not just because of it’s impact on how we move but also because it provides us with lessons on mindfulness and listening to ourselves before each movement. Previously Steve was the West Midlands Tai Chi Boxing champion, he enjoys teaching the martial arts side of Tai Chi which includes Chuan boxing and sparring. He also teaches standing meditation – a perfect antidote to the hustle and bustle of life. With Tai Chi classes running across the West Midlands you will always be able to find a class in an area near you and at a time to suit. We all know life is so busy but it is really important to book into a class and take the time for your practice. We also believe that classes should be accessible to all so as well as considering location we have also ensured that our classes are priced reasonably so our fees are £6 or less and are on a pay as you go basis meaning that Tai Chi classes in the West Midlands are open for everyone to access. Check out our tai chi class location page to find somewhere to practice Tai Chi near you. Our classes take place in Birmingham and surrounding areas including Solihill and Walsall. This means that we can offer a varied class timetable to suit Monday to Friday 9-5 workers as well as those who work shifts, freelance or are stay at home parents. Our unique support means we can cater for beginners to the more experienced Tai Chi fan! If you are new to Tai Chi don’t be nervous, all our teachers are able to take the time to talk you through your practise. You may also consider a private class. These are also perfectly adapted to suit everyone that comes through the doors of Central Tai Chi. Some people love to attend classes but we fully appreciated that 121 classes work and if there is something particular you want to learn. If you prefer a 121 experience then we can cater to the needs of your unique practise by offering a limited number of 1 hour slots. From £25 per session private classes are still at an affordable rate and take place on a weekend. If you have a family group or friends coming together you can do this too! Just let us know. What and Why Tai Chi? Tai Chi is a martial art practise that is made up of very gentle physical movements and mindfulness. Breathe work and self awareness are the basic elements of Tai Chi and they have been used since the 13th century. It is relaxing and non strenuous built around a foundation of calm in body and mind. There are 3 different types of Tai Chi – they are called yang, chen and wu. Most teachers blend the different types into one group class as the speed and posture is unique to the individual. Tai Chi is perfect for those who are looking for a gentle practise. Your mind needs to be open as this practise is more for those that are looking for self discipline and movements that are guided by your own body and being. As it is a low impact practise it is ideal to do at any age and is often suggested for older people who suffer from bone and joint pain. The practice itself is calming and fluid meaning it doesn’t feel hard to do. Check out a class near you now – we know you’ll love it as much as we do! 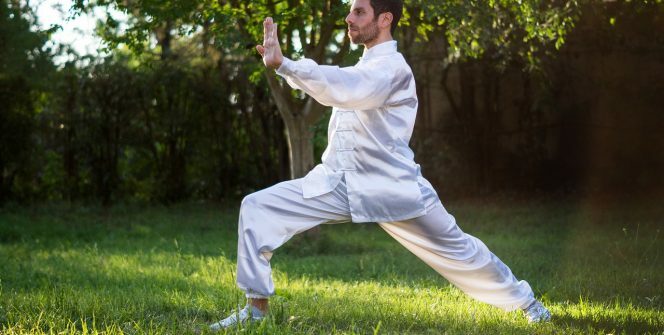 The health benefits of Tai Chi are vast. We could try and cover them all but here are a few ways we know Tai chi helps others. Firstly simply using the breath in your techniques will be relaxing and help relax your busy mind from all the hustle and bustle of the world. In a time where everyone is so busy and technology plays a part in daily life it is very important that we learn to switch off and listen to our body and mind. If you have a low fitness level then Tai Chi is a great practice to start increasing those levels too. It is often ‘prescribed’ to less mobile or older people who struggle with mobility in their daily lives. By increasing body and mind movements it helps with co-ordination too so perfect for anyone that has trouble with their upper or lower body movements and flexibility. It can aid people with arthritis and has been known to increase mobility in people struggling with this too. It is perfect to practise at the end of everyday if you have been on the go in an active job or sat at a desk all day as it aids muscular strength. Not just for the over 60’s! Everyone should be practicing Tai Chi. We all know that the modern world has increasing levels of stress for us. Being conscious of this and adapting our practise is really important and it never is to early to start. With constant pressures in the world around the practice of Tai Chi becomes increasingly important. Poor posture, stress and varied working environments have an impact. The fluid and calm movements of Tai Chi give the body freedom from the constraints and noise of the modern world. 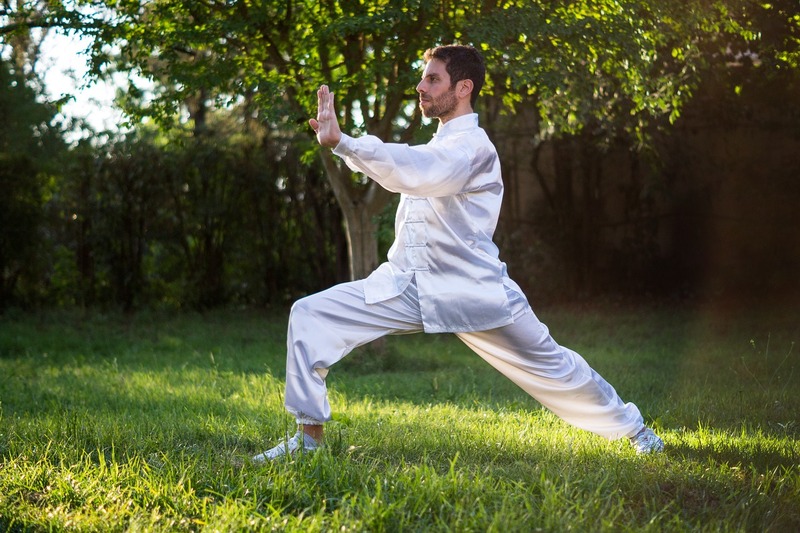 As a daily exercise, unlike other activities, Tai Chi is injury free. This is because we consider our moments and relax into the practise. Nothing is pushed and instead we flow into each movement.